Individually labeled newly emerged honeybee workers were introduced into three queenright host colonies. The host colonies were housed in observation hives with one brood frame. The location of the workers during their first eleven days of life was monitored. In the initial phase of the experiment, the queen was allowed to roam freely in the colony. In a second phase of the experiment the queen was caged on one side of the frame. In all three colonies workers were observed either being attracted to or avoiding the queen. The mandibular gland secretions of workers attracted to the queen more often had the typical worker like mandibular gland secretion whereas workers avoiding the queen, produced a mandibular gland secretion more similar to that of a queen. 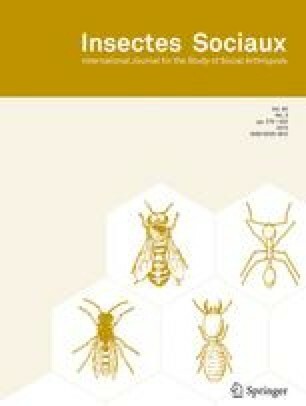 This suggests that the workers avoiding the queen are attempting to escape queen control which otherwise suppresses the secretion of queen like pheromones. Key words:Apis mellifera capensis, spatial distribution, queen pheromone, worker reproduction. Reived 20 August 2001; revised 10 December 2001; accepted 13 December 2001.